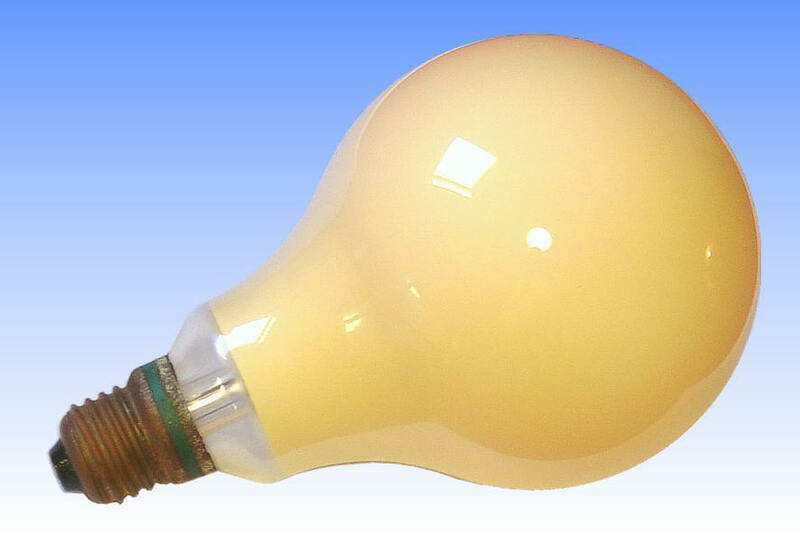 The first mercury lamp to bear a phosphor coating was the MAF 400W type, invented by the General Electric Company of England in 1937. That same year, the principle was also applied to Philips' low wattage quartz MB lamps. The first phosphor was Zinc Cadmium Sulphide with an activator of copper (Zn,Cd)S:Cu. This has a strong yellow body colour owing to the high cadmium content, leading to a partial absorption of the blue mercury lines. In the MAF lamp this shifted the colour of the net light output to an unpleasant greenish hue. Cadmium was added to the arc tubes to generate extra blue light, and shift the light back to a whiter colour. But this brought a small loss of efficacy. In the MB lamp, its quartz arc tube transmits shorter wavelengths of ultraviolet energy, which cannot escape from the glass MA arc tube. Thus it became possible to employ phosphors stimulated by these new UV wavelengths. Two phosphors are employed in this lamp. The first is the same (Zn,Cd)S:Cu, but it is augmented by a second phosphor of Zinc sulphide with an activator of silver, ZnS:Ag. This radiates blue light, replacing the mercury lines absorbed by the main phosphor. Thus the inefficient cadmium doping of the MAF lamp could be dispensed with. Consequently MBF lamps achieved nearly the same luminous efficacy as for uncoated MB types. Incidentally the bulb size for these first MBF lamps is grossly oversized. This is due to the extreme temperature sensitivity of the ZnS:Ag phosphor, which had to be kept below 100-125°C. 175°C could be tolerated for the first MAF phosphor.